Paul spends his days working directly with Veterans throughout his region, which includes Douglas, Bayfield, Ashland, Iron, Burnett, Washburn, Sawyer, Polk, Barron, and Rusk counties. Serving in the Wisconsin Army National Guard and being deployed to Iraq, Huber’s experiences haven’t only prepared him with a certain mentality, but his service helps him bond with and gain the trust of Veterans in need suffering from mental health or substance abuse issues. Huber is the Region 4 coordinator of the Wisconsin Department of Veterans Affairs’ Veterans Outreach and Recovery Program. Coordinators like Huber work throughout the state to connect Veterans to community services, provide case management and support with a special focus on treatment and recovery. He has an office in Superior, but is rarely able to spend time in it. He spends his days working directly with Veterans throughout his region, which includes Douglas, Bayfield, Ashland, Iron, Burnett, Washburn, Sawyer, Polk, Barron, and Rusk counties. Through the VORP, Veterans can receive crisis services in addition to on-the-street case management in order to get them treatment for mental health and/or substance abuse, including paying for private treatment. Collaboration is a key of Huber’s job, and he works closely with County Veterans Service Officers, Veteran service organizations, local government agencies, community nonprofits, and others, so that Veterans may also receive individualized wrap-around services such as housing, food, clothing, furniture, education, and employment. A Marine and his wife, both who are in their 80s, contacted Huber for assistance after suffering issues with a well inside their home. Through collaboration between the WDVA and the Douglas County CVSO, the repair bill was paid in full. 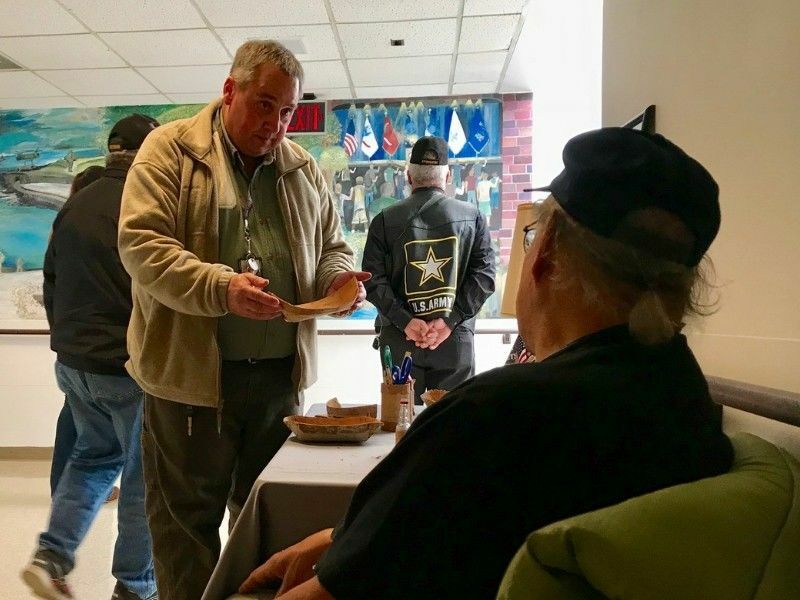 The result allowed the Veteran and his wife to continue living in their home, and she was able to continue baking bread and making jelly to gift to their neighbors. The WDVA’s Veterans Outreach and Recovery Program started out as a pilot program in 49 counties in 2014 and recently expanded to all 72 counties in Wisconsin. Since the program’s inception, coordinators have helped about 500 Veterans obtain mental health services, substance and alcohol treatment, and other supportive services. If you know of a Veteran in need, you can call or text Huber at 715-558-2557.